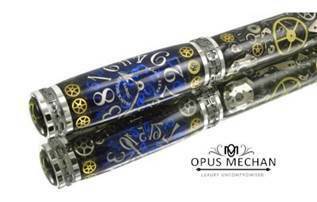 The Michigan Pen Club is pleased to announce that our 2019 pen show will be organized and promoted by Dale Penkala and Isaac Hannosh of Opus Mechan, Inc. (PenHub). This transition was approved in order to substantially enlarge our Detroit-area pen show in size and with the addition of another day, making it a 3-day weekend event open to the public starting on Friday, October 18th. And it will be the same location as last time at the Four Points by Sheraton in Novi. Meeting at the Goodman's house. The meeting will be about the results of our past Pen Show and the report out for the 2019 Detroit Pen Show transition. There is also going to be an status update for estate of pens and they will be available for purchase. If you are new and haven't been to the Goodman's before then send me an eMail using the contacts link. Starting today the club is working on an inventory of pens that will be made available as they are posted. There are about 400-500 pens to photograph and catalog, so this will be a work in process. Stop by often over the next few weeks. Here is just a little sample. Place holder for the next event. I have acquired and estate of 400-500 pens. There is everything from A-Z in this collection (literally Aurora-Zeppelin). There are lots of Limited Edition as well as every day bargains. About half of them are from them are from 1900-1990, and half from 1990-2010ish. I've gotten through the fourth box so I'm putting those up today. Since I'm a Parker guy I'm saving those 'til last. During the transition to the new website host provider ther is a lot going on behind the scenes. Mail is now working so I'm updating the links page. Cleaning up the Forms on the site will be next. Well I was going through the Estate 04 box of other pens and came across this little unused gem. So, I'm going to keep it here in the home page for now, and you can put a silent auction bid in on it using the form on the Estate 04 page, ITEM 04MC01, let's have some fun and let the bidding begin!! Sheaffer 1996 Limited Edition Holly Pen. The Hand Painted cap decoration was inspired by artist Coles Phillips' original illustration in Sheaffer's 1920 advertising. I got a text message from Musette Lax who attended a previous meeting. ​I asked her if it was ok to share this.